It’s a reliable price action tool to trade binary options with relatively short expiry times. This BO strategy is based on pin bars. So it’s very important that you know how they look like (see illustration below). 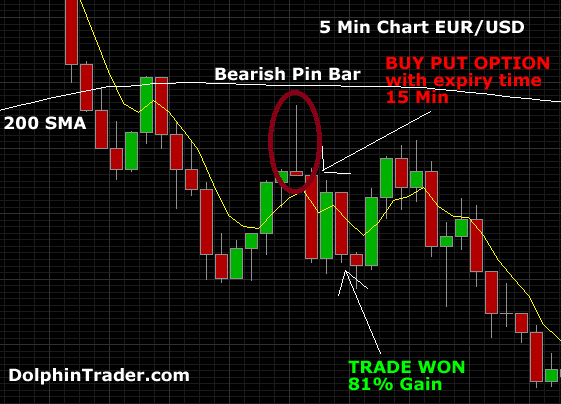 I will show you how to trade the 5 min trading charts using pin bars with 15 min expiry time. Download the Pin Bar Indicator for Metatrader 4. The above EUR/USD chart is a great example of a bearish pin bar forming during a down trend (price below 200 SMA). According to the strategy rules: Buy PUT option at the open of the next candlestick with expiry 15 min.